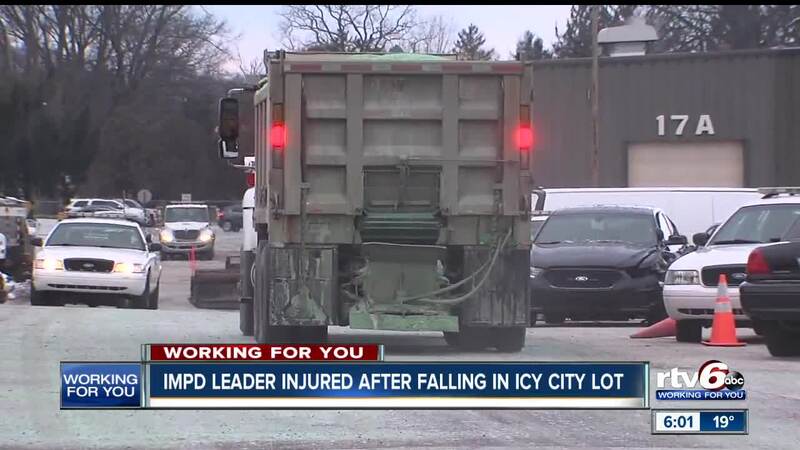 INDIANAPOLIS — A deputy chief with the Indianapolis Metropolitan Police Department is recovering after he slipped in an icy parking lot owned by the city and had to be rushed to the hospital. Thursday morning, IMPD Deputy Chief Josh Barker was dropping off his vehicle at one of the city’s repair facilities off 30th Street and Riverside Drive when he slipped on ice and ended up in the hospital with broken bones. Just 30 minutes after Barker went to the hospital, RTV6 cameras captured a DPW salt truck covering the parking lot where he had fallen. So why wasn’t the parking lot cleared and salted that morning? Marion County’s Building Authority say they are responsible for cleaning sidewalks at most city/county buildings, but the one at 30th Street and Riverside Drive is DPW’s responsibility. DPW says they did salt the parking lot, but they only have the ability to salt and clear areas that are clear from parked vehicles, so they can’t always get the areas that are walked on the most.